Like most of my poems, “Lies We Are Told Of The Nature Of Our Wounds” was a hand-written entry in my journal. I spent six months traveling between the US and Denmark while going through a rough breakup. I had no permanent address and was living out of hotel rooms and my car. 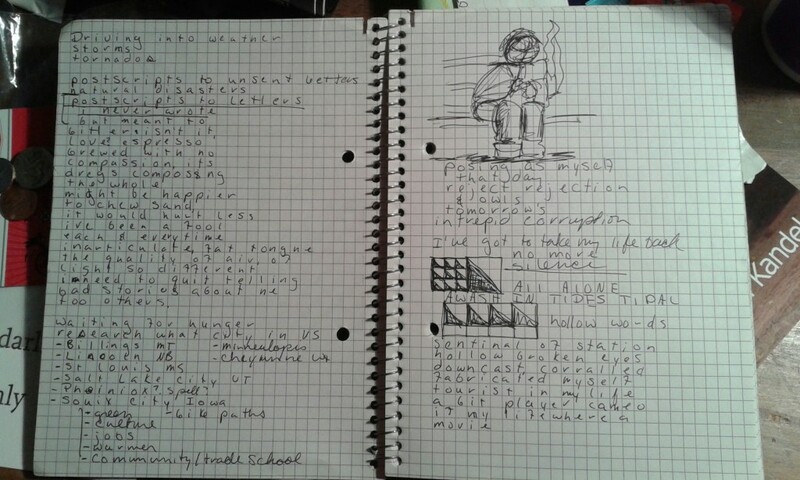 After returning home, I transcribed the entries exactly as they appeared in my travel journals, alongside Danish translations, notes from work, and ideas for stories. After a two month incubation, I began breaking entries into the first actual drafts. This poem started as a very long piece about coming from an abusive marriage without being willing or able to talk about it, literally because of the language barrier and figuratively, with my most recent ex. My revision process on this piece has been deleting and deleting over the years. This latest revision cuts to the heart of being a woman and doesn’t hint at redemption. I rent a house in Grand Forks, North Dakota, and during winter my office is 20 degrees colder than the rest of the house. I’ve been writing and painting at the kitchen table when the family is away and I am starting a poem series about the room being haunted.